MEPs from five political groups have sent a letter to their colleagues to brief them about the PMOI lobby in the European Parliament. 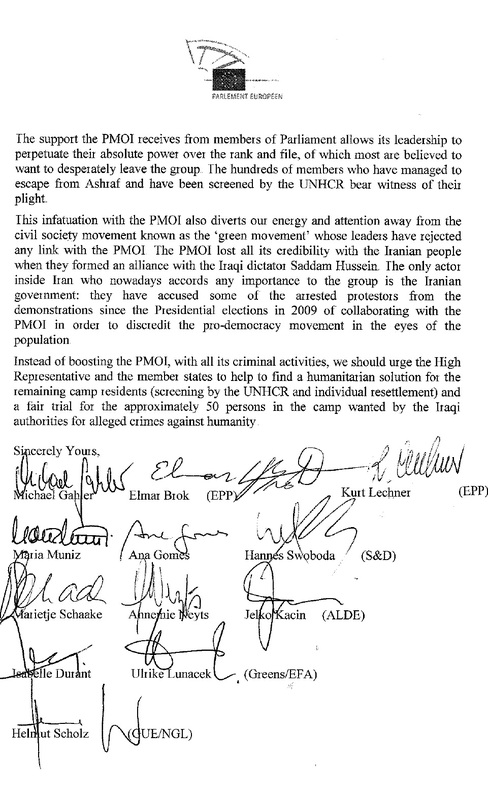 The letter, copied below, says that while the deaths at Camp Ashraf were uncacceptable, MEPs should not ignore the MEKs history in Iraq and the overwhelming evidence of human rights abuses inside the MEK. The letter called for screeing and resettlement of individual camp residents and fair trials for members which Iraq alleges have committed crimes against humanity in their country. 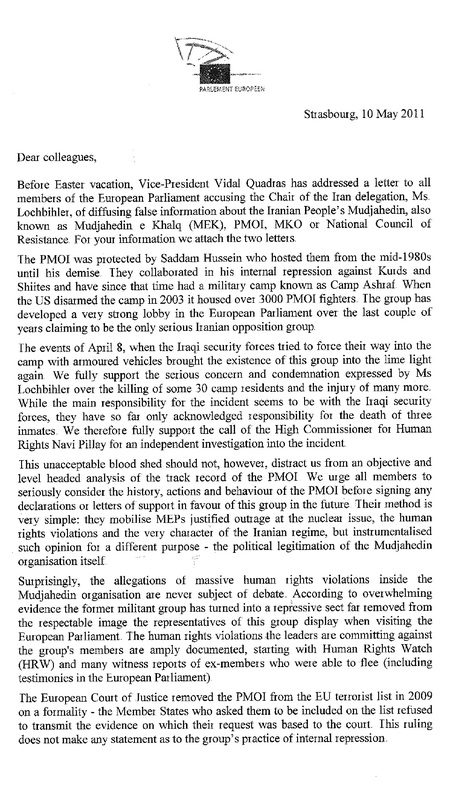 Before Easter vacation, Vice-President Vidal Quadras has addressed a letter to all members of the European Parliament accusing the Chair of the Iran delegation, Ms. Lochbihler, of diffusing false information about the Iranian People’s Mujahedin, also known as Mujahedin e Khalq (MEK), PMOI, MKO or National Council of Resistance. For your information we attach the two letters. 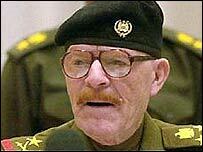 The PMOI was protected by Saddam Hussein who hosted them from the mid-1980s until his demise. 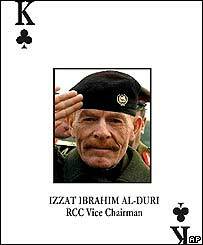 They collaborated in his internal repression against Kurds and Shiites and have since that time had a military camp known as Camp Ashraf. 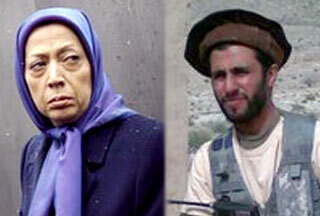 When the US disarmed the camp in 2003 it housed over 3000 PMOI fighters. 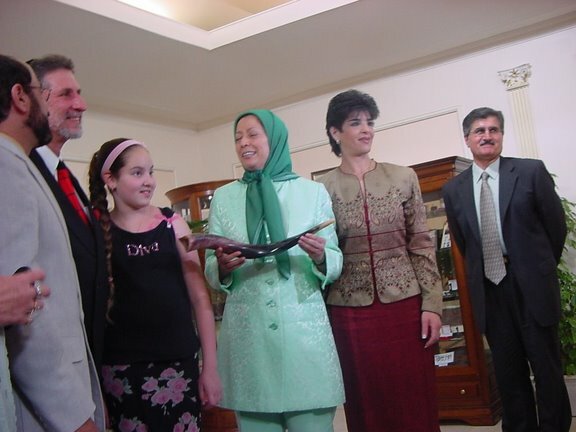 The group has developed a very strong lobby in the European Parliament over the last couple of years claiming to be the only serious Iranian opposition group. The events of April 8, when the Iraqi security forces tried to force their way into the camp with armoured vehicles brought the existence of this group into the lime light again. We fully support the serious concern and condemnation expressed by Ms Lochbihler over the killing of some 30 camp residents and the injury of many more. While the main responsibility for the incident seems to be with the Iraqi security forces, they have so far only acknowledged responsibility for the death of three inmates. We therefore fully support the call of the High Commissioner for Human Rights Navi Pillay for an independent investigation into the incident. This unacceptable blood shed should not, however, distract us from an objective and level headed analysis of the track record of the PMOI. We urge all members to seriously consider the history, actions and behaviour of the PMOI before signing any declarations or letters of support in favour of this group in the future. 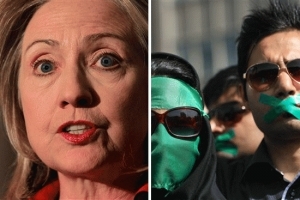 Their method is very simple: they mobilise MEPs justified outrage at the nuclear issue, the human rights violations and the very character of the Iranian regime, but instrumentalised such opinion for a different purpose – the political legitimation of the Mujahedin organisation itself. 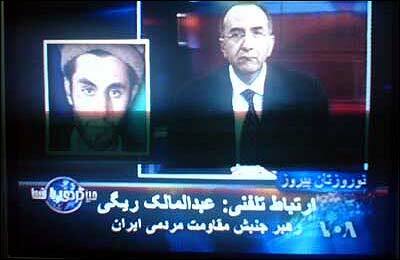 Surprisingly, the allegations of massive human rights violations inside the Mujahedin organisation are never subject of debate. According to overwhelming evidence the former militant group has turned into a repressive sect far removed from the respectable image the representatives of this group display when visiting the European Parliament. The human rights violations the leaders are committing against the group’s members are amply documented, starting with Human Rights Watch (HRW) and many witness reports of ex-members who were able to flee (including testimonies in the European Parliament). The European Court of Justice removed the PMOI from the EU terrorist list in 2009 on a formality – the Member States who asked them to be included on the list refused to transmit the evidence on which their request was based to the court. This ruling does not make any statement as to the group’s practice of internal repression. The support the PMOI receives from members of Parliament allows its leadership to perpetuate their absolute power over the rank and file, of which most are believed to want to desperately leave the group. The hundreds of members who have managed to escape from Ashraf and have been screened by the UNHCR bear witness of their plight. This infatuation with the PMOI also diverts our energy and attention away from the civil society movement known as the ‘green movement’ whose leaders have rejected any link with the PMOI. 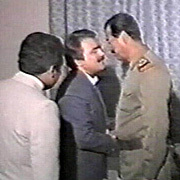 The PMOI lost all its credibility with the Iranian people when they formed an alliance with the Iraqi dictator Saddam Hussein. 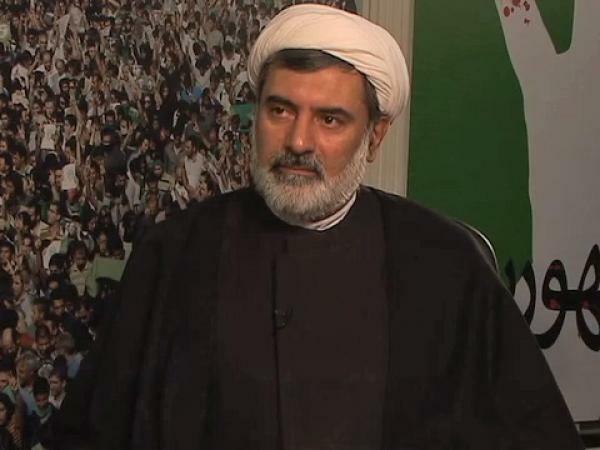 The only actor inside Iran who nowadays accords any importance to the group is the Iranian government: they have accused some of the arrested protestors from the demonstrations since the Presidential elections of 2009 of collaborating with the PMOI in order to discredit the pro-democracy movement in the eyes of the population. Instead of boosting the PMOI, with all its criminal activities, we should urge the High Representative and the member states to help to find a humanitarian solution for the remaining camp residents (screening by the UNHCR and individual resettlement) and a fair trial for the approximately 50 persons in the camp wanted by the Iraqi authorities for alleged crimes against humanity.